People who move out of Chicago have justifiable reasons for leaving--soul-crushing winters being a popular reason--but no one ever says they miss the food. Chicago has great food in every variety and price point, from the chemistry lab that is Alinea, to the bowls of chili at Ramova Grill (which closes mid-May; get over there now). So when one leaves the friendly confines of Cook County, what sorts of Chicago cuisine can they encounter in the outside world? And how does it measure up against what we know so well? I've become less embarrassed about my culinary tourism in the last couple of years; rather than scouting out a site of Civil War battle or an art museum when I travel, my itineraries are dictated by meals. I can see art on the internet if I want to, and museums don't allow food from the outside, so what's the point? I need to kill multiple birds with one stone, or I'm just wasting my time. A few months back, I traveled to San Francisco for a long holiday vacation. 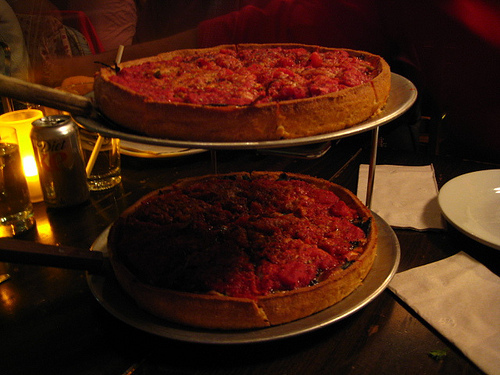 I had a short list of places to visit, among them Little Star, a Mission-area restaurant that served deep-dish pizza. 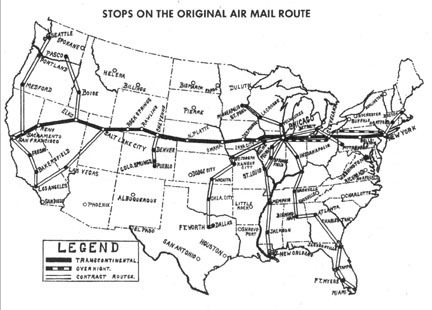 Why eat pizza in SF when I've got infinite delivery options at home? Why bother? A comment made by my brother, a longtime SF resident and amateur food critic (it runs in the family), as he took a bite of a pie from Art of Pizza on a visit to Chicago earlier that fall. "This is okay," he said as he shrugged, not noticing that my eyes had rolled into my cranium. "But there's a place in San Fran that will blow this out of the water." Really? I had to find out if this braggart had a point. The interior of Little Star is far different from what we know as pizza places around here--brick walls, dim lighting, votives on the tables, and a jukebox full of (very tasteful) indie and new wave. Not a single mirrored beer advertisement or a flat-screen television in the entire place. I expected smarm from the server, a rugged-looking gentleman who looked as if he would be more at ease at a barn raising, but was happily wrong. We started off with a colorful mixed salad and a gratis pizza bread appetizer, which made the final course--the Little Star deep dish, laden with spinach, feta and mushroom, as well as a plain sausage variety--very difficult to consider eating. The pizza wasn't the best I'll ever have (the cornmeal crust was really dry and overbaked, a big no-no in my book), but the California-blessed quality of the main ingredients, coupled with knowing that I helped the environment by eating food that didn't take a three-day journey in a truck to feed me, made the trip enjoyable. Adding to the experience was the served dish of Humphry Slocombe's "Secret Breakfast" (hint: it has corn flakes and alcohol in it) that ended the meal. Most of the pizza I've ever eaten in Chicago has been in my home, as it never seems to be the kind of food that I'm willing to order in a restaurant; if my favorite local places decided to drop the fluorescent lighting, get a decent bar and play some music other than Bob Seger, I could save a lot in plane fare. -R.N. When I mention a Chicago dog in New York, I always get the same response: "Chicago? Don't they put a lot of...STUFF on them there?" I've never understood why a milky-sweet tropical drink is a good companion for a hot dog, but perhaps I'm just missing something because there are several varieties of these papaya-drink-plus-hot-dog spots in the city. I got a dog with mustard, sauerkraut, and "red onion sauce"--soft cooked onions in a thin tomato sauce that might be a little too close to ketchup for Chicago purists, but which is a common (and delicious) topping here. This was the winner in my book, both on price and taste. The grilled dog had a nice snap and flavor, and at just over $2 for a hot dog and a drink (Gray's also has a famous "recession special" that is two dogs and a drink for $5), I actually left with enough money to get back on the subway. This Brooklyn outpost is similar to Hot Doug's in that you can outfit your dog with unusual toppings (the "Tsunami" features bacon, teriyaki, pineapple and green onions). I went with the namesake Crif Dog, which is smoked to order and deep-fried. 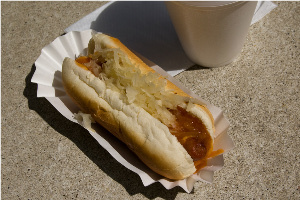 I regretted it when it lacked the nice texture of the grilled ones, and found that when topped with mustard, sauerkraut, and pickles, the bun ended up wet and soggy and the whole thing was hard to eat. And almost nine bucks for a dog, tater tots and a drink? I know this is New York, but in the end this is street food and I'm not interested in paying more than five or six bucks for it. Worth special mention is the original Nathan's on the boardwalk at Coney Island--site of the International Hot Dog-Eating Contest. This was actually my favorite hot dog of the bunch, although it is not so vastly superior to Gray's that I'd make a special trip just for it. If you're visiting Coney Island, though, it's worth making a stop--the salty air, crowds and the sounds of those rickety rides in the background only add to the experience. -L.S. 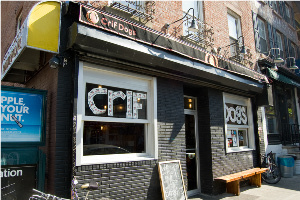 The best thing about Crif Dogs is PDT, the cocktail bar accessible through a fake phone booth in the hot dog stand. It just won a Beard award, and you can get a hot dog in there with your drink, from a completely different menu. Not that I would ever suggest actually going to a Mets game but the new Citi Field has a culinary bonus: an outpost of chef Danny Meyer's Shake Shack that showcases the Shack-cago-style dog: a Vienna all-beef dog on a poppy-seed bun with all the trimmings (plus some) - onion, cucumber, pickles, tomatoes, sport peppers - and topped with celery salt, Rick's Picks relish and yellow mustard.